The criminal justice process is dependent on accurate documentation. Criminal justice professionals can spend 50-75% of their time writing administrative and research reports. 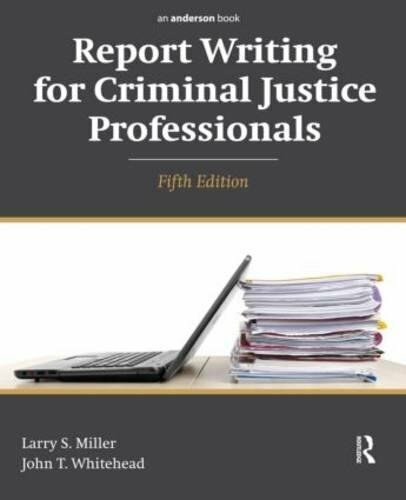 Report Writing for Criminal Justice Professionals, Fifth EditionÂ provides practical guidance--with specific writing samples and guidelines--for providing strong reports. Much of the legal process depends on careful documentation and the crucial information that lies within, but most law enforcement, security, corrections, and probation and parole officers have not had adequate training in how to provide well-written, accurate, brief, and complete reports. Report Writing for Criminal Justice Professionals covers everything officers need to learn--from basic English grammar to the difficult but often-ignored problem of creating documentation that will hold up in court. This new edition is updated to include timely information, including extensive coverage of digital reporting, updates on legal issues and privacy rights, and expanded coverage of forensics and scientific reporting. About: The criminal justice process is dependent on accurate documentation. About: Provides practical advice on report writing―with specific writing samples and guidelines for law enforcement, security, corrections and probation personnel that is organized into three sections: The Nature of Report Writing, The Mechanics of Report Writing, and the Modernization of Report Writing.